I'm writing to you at the end of my day - actually, the end of my week of #EssentialOilTherapy. When the week started, I was feeling miserable. Sore throat, achy muscles, super tired. 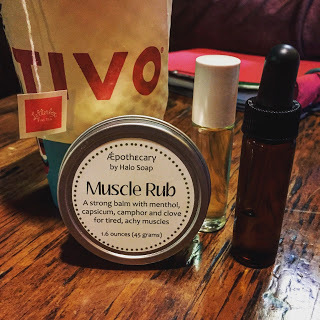 Instead of seeing this as a week of soap making that would be wasted because I was too weak and exhausted to move, I viewed it as an opportunity to try out some natural botanical and essential oil healing! Read on to hear about my ailments, how I worked through them and how you can use similar methods at home! With cold season approaching, it's time to stock up on natural healing ingredients. I was all stuffed up. My head had a constant dull, achy thud going on. I decided to blend myself a roll on. These are usually a blend of essential oils placed in a glass roller bottle in a carrier oil like jojoba oil or fractionated coconut oil. I like to use the coconut oil. Some people prefer organic jojoba oil. Personal preference really. Then you roll them on your wrists, neck, temples and any other pulse points you find beneficial. Fill 'er up with carrier oil (I used fractionated coconut oil), cap and done! While I have quite the stock pile of pure essential oils that I use in product making, I know not everyone has a massive shelf dedicated to goodies like these. You can visit my friend Jen via Facebook and she'll fill you in on how to get your own stock going at home. If blending your own roll on isn't for you, check out 21drops. They have some great roll on blends. You can buy them locally at Deep Roots Massage. Next, I wanted something to restore and maintain some of my natural immunity. I had already been downing multiple cups of tea a day. (For those of you who know me, it's no secret that I typically thrive on creamy, boozed-up coffee. I know this is unhealthy, so going forward you'll probably see a lot more posts about incorporating tea into my daily health routine, not just into my soap!) I have a lovely stock pile of Rishi Tea, Gypsy Tea, Fava Tea, and more. I put all of these into a glass dropper bottle. Now I have a little bottle of immunity to carry around with me. I've actually been putting this bad boy in my tea and coffee (yes, I still indulge once in a while). I think it adds a lovely flavor. Just make sure you mix your tea well so you don't gulp down a little oily spot of pure essential oils! Again, Jen can help you get starting using essential oils at home. Finally, to soothe my achy muscles, I've been loading up on my Muscle Rub. This product is a lovely little tin that is loaded with ingredients to soothe tired, achy muscles. Camphor, menthol, capsicum, eucalyptus, cinnamon - all ingredients to give your body a tingly feeling that says "I'm working these aches and pains right out of you!" Wholesale Supplies Plus has some great ingredients and containers to get you started. 21drops has some pre-blended products for you that you can also get in the Milwaukee area at Deep Roots Massage. Finally, you can reach out to us at Halo Soap!